Love this reminder to never neglect the child still inside us for too long. I did something this morning that was a bit unlike me. See, I’m the more structured parent. The one that makes sure showers are regular, rugs are vacuumed and thank you cards are written, but I can be silly. I love to laugh, but it seems like the older I get, the harder it is to be spontaneous. Sometimes my husband will see me dancing in the kitchen like a goon or hear me making up a song in a silly voice. He recently said something to me that was meant as a reminder, but in the same sense hurt my feelings. “There’s the Rebecca that I love.” It stopped me in my goon-like dance moves. What do you mean? “No, nothing. I just love when you act like that.” It got me thinking; where did THAT Rebecca go and I miss her too. There’s something about the sun, no matter the season, that warms the heart even when the body is cold. I once hated the sun. I closed my blinds and my mind to it because I didn’t feel the warmth within myself. It was a reminder that my nature didn’t match the nature outside. Now that I’m feeling better once of my favorite times of the day is whenever the sun makes a direct appearance outside the window of the room I happen to be in. I love taking a bath in a sunfilled bathroom or snapping pictures of the kids with the perfect afternoon sunbeams making my pictures shine. I feel the happiness that only it can bring even when its less than -20 degrees Celsius outside. 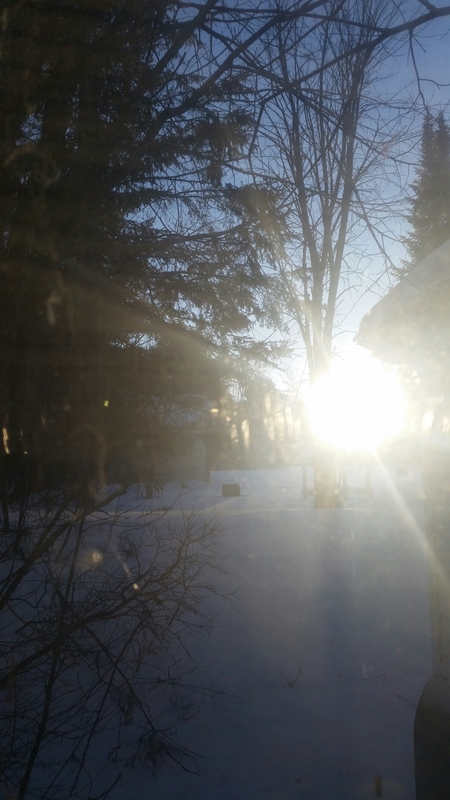 Even the great Canadian Freeze can’t stop sunshine! I want to be sunshine. Unstoppable, warm, happy, and free.